The Short version: Dr. Paulette Sherman is a psychologist who has developed a reputation as an effective relationship coach. For many years, Dr. Sherman wrote weekly advice columns, spoke on dating issues, and drew attention from primarily young daters struggling to find love. While she still works with that core demographic, she also helps her clients navigate through all life stages — from getting married to having and raising children. Aiming to reach those who don’t live in New York City, Dr. Sherman uses her writing as a way to have a wider impact. Not only does she continue to provide advice as a columnist, but she also has written more than 20 books on a variety of topics. Throughout her decades in practice, Psychologist and Coach Dr. Paulette Sherman has attracted a shifting swath of clients interested in improving their relationships. Interestingly, many of the people she has worked with have mirrored her life stage at the time. For example, when she was dating, her clients were often young female daters; when she married, she attracted more couples seeking therapy. In the early years of her practice, Dr. Sherman attracted singles who struggled to find dates and succeed in relationships. Noticing a need for both advice and literature about dating, Dr. Sherman set out to create those materials. First, she developed classes to teach singles about more productive dating strategies. Dr. Paulette Sherman became well-known after writing her first book, and she has since written 20 more on an array of topics. She set out to write a dating manual, and when it was completed, it struck a chord in the psychology community. The manual, “Dating from the Inside Out: How to Use the Law of Attraction in Matters of the Heart,” was published by Simon and Schuster. In turn, the manual open the door for speaking events and television appearances. Dr. Sherman also started writing a monthly column in which she was billed as the New York Love Examiner. As she became well-known as a relationship expert, Dr. Sherman earned a reputation for helping singles better navigate their dating lives. Then Dr. Sherman got married and had children of her own. As she moved away from dating, she became interested in counseling clients about their marriages and families. Now, half of her client list is made up of daters and the other half are those seeking marriage counseling. While Dr. Sherman’s foray into dating coaching may have been somewhat serendipitous, her desire to help others was thoroughly planned. In graduate school, she considered focusing on child therapy, though she still showed an interest in helping couples develop their relationships. Now, Dr. Sherman recognizes that her practice is exactly what she hoped it would be. “I feel like dating is deep enough that you can find their core patterns and help with self-esteem, but then you get to see the happy ending,” she said. Dr. Sherman works with women, men, and couples in her practice. As her personal life and writing work take more of her time, she has consolidated her counseling into fewer days. In her New York offices, she typically sees clients during two long days each week and she does relationship consulting three evenings a week. Generally, clients see Dr. Sherman at a set time weekly, and she speaks with some clients over the phone once a week. Over her years as a therapist, Dr. Sherman has seen some significant changes in dating and relationships. One is the shifting power dynamic between men and women. “Women used to think that men should take the lead, but that is changing. Women are getting more clear and empowered,” she said. Still, some women fear scaring off their partners if they exert their power and influence. For these women, Dr. Sherman wrote the book “When Mars Women Date.” This self-help book describes how successful women may not need to seek mates at their same level, professionally. Instead, the book describes how many successful women have found men who supported them in their careers, though they may not have equally dynamic careers of their own. After she wrote her first dating manual, Dr. Sherman caught the writing bug. Now she writes several days a week when she isn’t counseling or coaching. Though her time as the New York Love Examiner has ended, Dr. Sherman now writes a column for Eligible Magazine. But more than just writing columns, Dr. Sherman also has written 20 more books after that first successful dating manual. Her subsequent efforts have spanned the range of dating and relationship advice, but she also writes on more unusual topics. One of her dating-related books is titled “A Shared Vision: 100 Conversations for Couples to Co-Create the Lives of Their Dreams.” The book encourages couples to have a series of talks that can help them align their vision about their lives. “You can create a shared vision board — a tool for daters and couples to get on the same page about what they’re excited about creating,” she said. Dr. Sherman is an expert in helping people deal with relationships. She also has written a tome on dating without breaking the bank called “100 Ways to Treat Your Mate Like Royalty for Under $10.” The book is about affordable ways to make a partner feel special. “My husband and I go on dates every Friday in New York, and they’re always cheap,” Dr. Sherman said. Her latest effort is titled “The Book of Sacred Baths,” and it offers 52 ways to use bathing to relax and gain clarity. Specifically, Dr. Sherman has listed bath recipes for different situations — such as dating, career advancement, and releasing negative thoughts. There are baths for singles and a whole section on couples baths. Other dating-oriented books include “We Are From One Planet,” a children’s book about the differences he saw between men and women. As Dr. Sherman continues to meet with clients who are at different stages in their lives and relationships, she has noticed one issue that frequently comes up. In the last few years, she has met with many women who want to have children before they lose their ability to do so. “Career-focused women who are almost out of their childbearing years come to see me about if they should meet someone, freeze their eggs, or think about other options,” she said. Dr. Sherman understands that counseling clients through these and other personal issues is not a simple endeavor. She knows that single clients can have self-sabotaging influences that might lead to mistakes in choosing and interacting with partners. As with many areas of life, dating dilemmas require serious thought and action. 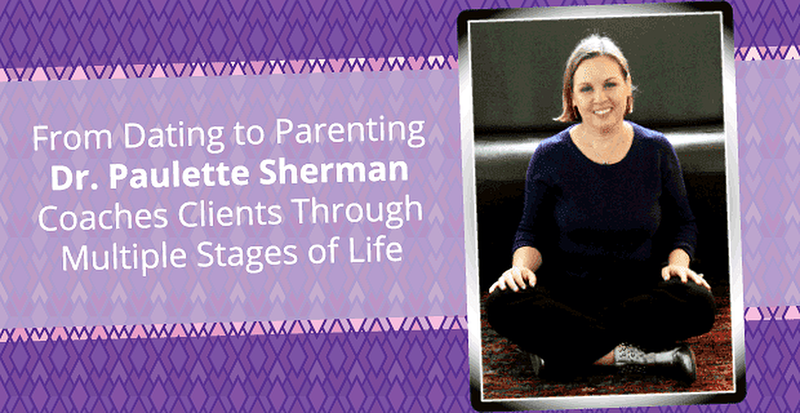 With a clientele at various life stages, Dr. Sherman continues to rely on her psychodynamic background. It helps her consider the patterns to which many of her dissatisfied daters might return. As a therapist, she helps her clients stop repeating these missteps and stop blaming others for their problems. Ultimately, Dr. Sherman finds her profession satisfying and fulfilling. It has certainly kept her on her toes with an ever-evolving client base of women who age and change. Plenty of her expertise comes from her background as a psychotherapist, but some also stems from personal experience. “I love helping people get what they truly want, and who you marry might be the most important decision of your life,” she said.